Soon it will be early spring in sagebrush country, and insects will be eager to find plants that provide nectar, pollen, or other yummy flower parts for food. Many early-spring flowers are in the mustard family (Brassicaceae) and buttercup family (Ranunculaceae). Many mustards and buttercups have bright yellow flowers. Bright yellow is a good color for attracting insects, because this color is also bright in ultraviolet, which many insects see well. But not all bright yellow plants are flowers. The yellow stuff above and below is a parasitic fungus—a type of rust (order Pucciniales)—growing on the leaves of a rock cress (Boechera sp.). The rock cress hasn’t flowered yet, and because of the fungal infection, this plant won’t produce real flowers at all this year. It will attract insects, though, because the fungus has produced zillions of little bright yellow spermatogonia on the leaves that cause the leaves to look superficially like flower petals. These spermatogonia exude spores (spermatia) that are carried by the visiting, feeding insects to other rock cress plants, just as they would normally carry pollen from flower to flower. This particular rust is Puccinia monoica (no relation to Mono County, as far as I can determine, though I’m not sure what the name refers to). Puccinia was named after Tommaso Puccini (1749-1811), a professor of anatomy in Florence, Italy. Floral mimicry is a deceitful, counterfeit way to make a living, but the rusts are obligate parasites and they have few options. Not all rusts are floral mimics, but those practicing this ruse are experts in their trade and are highly successful because if it. The rusts, like many parasites, have beautifully complex life cycles. Puccinia monoica infects additional hosts (the grasses, Koeleria, Trisetum, and Stipa, all of which live in this area), for another stage in its reproductive cycle. While on the grasses it does not engage in floral mimicry — that would be wasted effort indeed. Puccinia should not, however, be confused with Puccinellia, which is not a fungus, but a grass, Alkali grass. 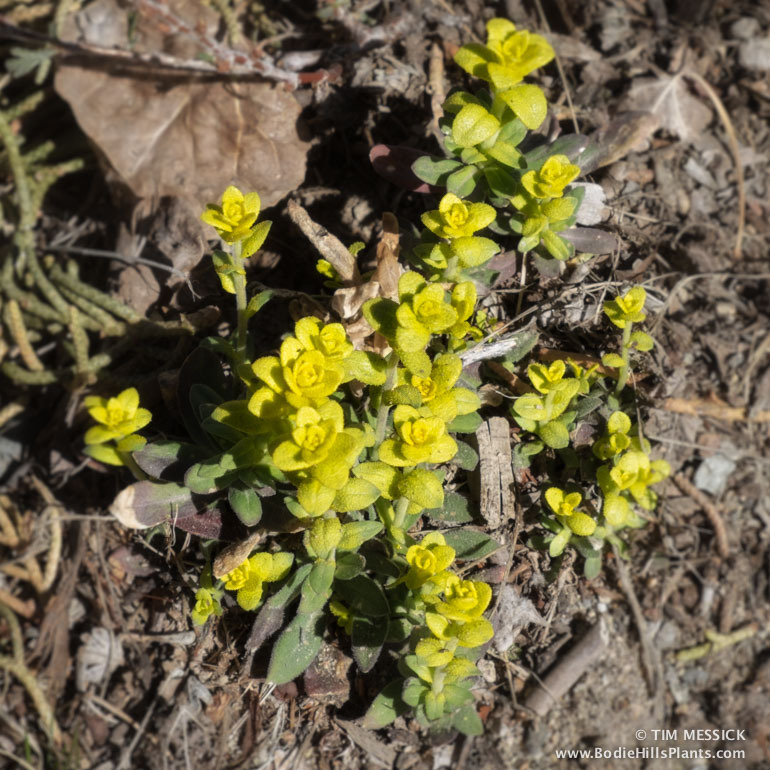 Three species (P. distans, P. lemmonii, and P. nuttalliana) occur in the Bodie Hills — at Travertine Hot Springs and other moist alkaline places in the region and across much of western North America. Puccinellia was named after another Italian, botanist Benedetto Luigi Puccinelli (1808- 1850). Phragmidium is another genus of rusts that infects leaves, stems, fruits, and flowers of roses, blackberries, and other members of the rose family (Rosaceae). Here’s one on Woods rose (Rosa woodsii) near the stream in the aspen grove in Masonic Gulch, near Lower Town Masonic. Phragmidium rusts are not floral mimics, and their spores may be largely wind-dispersed, but the bright orange of their spore-filled uredinia may attract some insect attention.